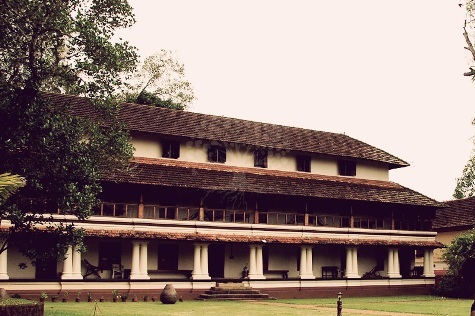 The Poomully Namboothiri family, whose ancestral home was known by the name Poomully Mana, resided in Urakam of Peruvanam village in the interiors of Kerala. This family lived in an era that dates back by about 900 years. 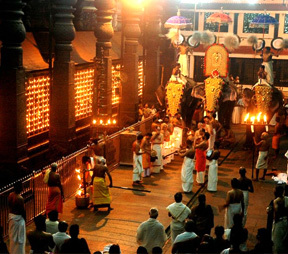 They built the original Ammathiruvadi Temple and left all their ancestral wealth to the Goddess and its administration to the Kingdom of Kochi. 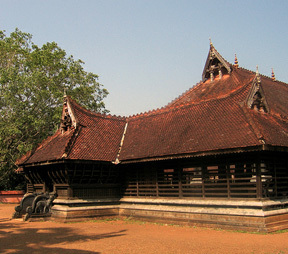 The family then relocated to Peringode (present-day Palakkad). In the 'Aithihyamala' (a collection of centuries-old stories from Kerala, covering a vast spectrum of lives, famous people and events), Poomully Mana features as one of the families that had a glorious history. The members of Poomully Mana were famous Ayurvedic exponents and practitioners of the Rig Veda, Yoga, Kalaripayattu (a form of martial art), music and other cultural arts. Some of the better known members are the Late Sri Poomully Narayanan Namboodirippad (father of Aaramthampuran and a famous Rig Veda practitioner), Late Sri Poomully Raman Namboothiripad (the exceptionally talented musician and student of Chembai Vaidyanatha Bhagavatar) and Late Sri Poomully Neelakandan Namboothiripad (Aaramthampuran, the inimitable Ayurveda practitioner). 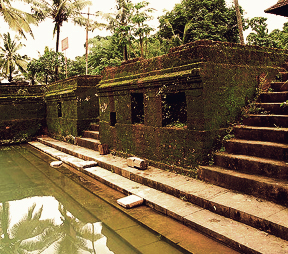 Poomully Aaramthampuran was the legend behind the Ayurvedic heritage of Poomully Mana. His expertise in all forms of arts and literature, Ayurveda, Kalaripayattu, Yoga and other performing arts earned him the name "Arivinte Thampuran" (lord/legend of knowledge). Today, Poomully Mana is visited by several renowned personalities from within and outside the country, seeking Ayurveda treatments. After the demise of Poomully Aramthampuran in 1997, a trust was formed by his family and disciples. The organization is headed by a Trust Board, which comprises seven trustees (including the Managing Trustee). Sri Poomully Narayanan Namboodirippad is the present ManagingTrustee. He has been holding this role since 1997. 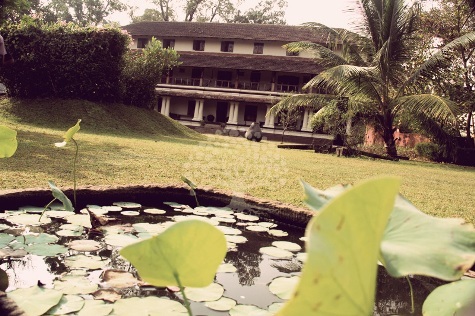 Poomully Mana is now a heritage Ayurvedic Centre that falls under the Poomully Aramthampuran Smaraka Trust managed by Poomully Heritage Ayurveda Pvt Ltd.
Dr.Aparna Poomully Mana(SaraswathyM.) and Dr.Arathi Poomully Mana are the doctors from this generation of the Poomully family. Dr.Aparna who is a disciple of Sri.Valloor Sankaran Namboodiri(Collegue of Aramthampuran) is the Chief Resident Physician while Dr.Arathi performs the role of Additional Resident Physician. Dr.Devan Namboodiri, who is the prime disciple of the late Aramthampuran, is an exponent in Ayurveda, Tarka, Meemamsa and Vedantha. He is the Chief Consulting Physician at the Centre. Graduated from Coimbatore ayruveda medical college and was the head of Shornur Ayurveda samajam, Ayurveda hospital. A disciple of Poomully Neelakandan Namboothiripad. More than 29 years of experience in Ayurveda treatments. Member of Poomully family who had graduated from Bangalore Sri Sri ayruveda medical college. She was the disciple of Sri. 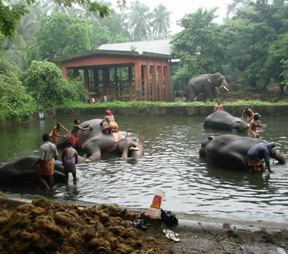 Valloor Namboodiri of famous Koodalloor tradition. Expert in Toxicology, Pediatric treatments, specialized Poomully way of treatments AND treatments for Motor Neuro diseases, Alzheimer, Parkinson's disease, Cancer, Infertility, Migraine & skin diseases. At 9.am to 5.pm on all days. Please ensure prior appointment. At 3.PM on all Saturdays & Tuesdays. Poomully Mana offers several treatments that cover all aspects of Ayurveda. Poomully Mana offer specialized treatments for spondylitis, arthritis, slip disc and chronic low back pain, sports-related injuries, bronchial diseases, breast/uterus cancer, stress, depression, diabetes, E.N.T. diseases, epilepsy, paralysis, migraine, Parkinson's disease, pediatric diseases (hyper activity, delayed walking, motor neuron disease, ADHD, etc. ), neurological complaints, obesity, psoriasis and other skin problems, haemorrhoids and anorectal diseases, gastric and liver problems, toxicology and Rasayana Chikitsa (Vatatapikam), and so on. Poomully Mana is providing treatments round the year. There will be changes in the treatments/therapies, medicines, diet, etc., according to seasonal changes as prescribed in classic Ayurvedic texts and depending upon each patient. We can get heavily booked. Hence advance reservation is advised for undergoing in-patient treatments. Normally, an advance booking of 30 to 45 days is recommended. Patients can either visit for an initial doctors consultation OR contact through email and get doctors reccomendations for fixing duration of treatment course. After finalizing dates with us, the reservation can be made either by making an advance deposit(for patients from within India) or by emailing us a copy of flight tickets(for patients from outside India). Please book your flight tickets only after finalizing dates with us. The treatments/therapies, medicines, diet, etc., to be followed during in-patient treatment days will be fixed only after the consultation at the time of admission and will be carried out according to each patient s response to our treatments and medicines. Vegetarian/pathya diet is provided at Poomully Mana. The pathya diet has a key role in the patient s well-being.Patients are not allowed to consume food that s not prepared at the Centre during the period of their treatment. Alchohol, tobacco and related products are strictly prohibited in the Centre. Qualified doctors and expert therapists; authentic ayurvedic treatments; eco-friendly and green surroundings; spacious bed rooms (with furniture in antique model); clean & hygenic attached bathrooms with hot water facility; and Internet are some features of in-patient facility. 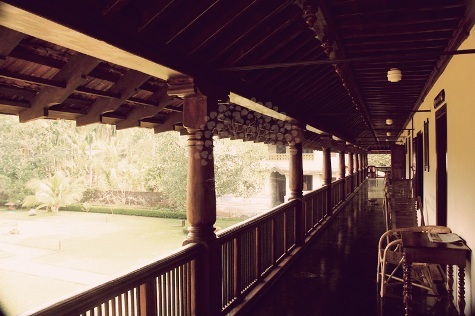 Our buildings are of the typical Kerala architecture, surrounded by herbal plants and trees, complete with natural traditional ponds. Udwarthanam - Herbal Powder Massage (45 minutes) - This is done with applying herbal powder all over the body and massaged in a special way. This is very good in reducing over weight of the body. Kadee Vasthi (45 minutes) - First of all an herbal massage is given in the affected part and a pool of herbal oil is kept in the lower lumbar area. This is very good in Lumbar disc aches and pains. Netra Tharpanam (45 minutes) - A dam of herbal oil and juices is kept around the eyes with the help of medicated paste. This is good to prevent eye strain and improve vision. This gives eyes a cooling action and is advised in so many eye disorders. Siro Dhara (45 minutes) - After giving a good head massage herbal oil is poured in an uninterrupted flow from a hanging vessel to the forehead and scalp. This is very good in relieving stress and strain and generates sleep. Thakra Dhara (45 minutes) - In this after giving head massage medicated Buttermilk is poured in an uninterrupted flow from a hanging vessel to the forehead and scalp. This is very good in treating scalp problems like dandruff, Psoriasis and other skin complaints. This gives head very cooling action and generates sleep. Ksheera Dhara (45 minutes) - After giving a full body massage medicated milk is poured all over the body using a specially made vessel called Kindi. This is very good to tone up the skin and prevents aging. Pizhichil (45 minutes) - The whole body is bathed in oil by pouring it uninterruptedly and giving synchronized massage. This is very good rejuvenating and stress relieving. This relieves aches and pain from muscles and joints. Avagaham (45 minutes) - Immerse yourself in a bath of herbal medicinal water with fresh flower petals and leaves. Navara Kizhi (45 minutes) - A special type of Rice called Navara is cooked in milk and herbal decoction is packed in small cotton bundles. With this the whole body is massaged. This is a good rejuvenating treatment. This improves the skin texture and the skin will glow after doing this. This improves circulation, relieves muscular stress and aches. Podi Kizhi (45 minutes) - In this powdered herbal leaves and roots are packed in cotton bags and the massage is done. This is very effective in cervical and spinal stiffness, aches and pain. Beautifully furnished spacious bed rooms with attached bathroom and toilets. Some of the classical features of Heritage rooms are - Each rooms are named with auspicious flowers and jewels. Furnished with antiques. The roof are paneled with wooden pallets to maintain the temperature. Colonial ethnic flooring with large windows for better air circulation. Classical paintings which depicts the Kerala's culture, art forms and festivals. 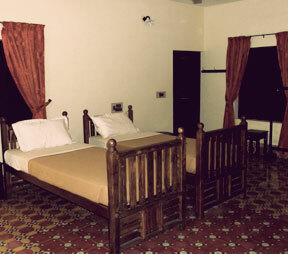 Each rooms are equipped with telephones and internet (dial-up)Hot water in all rooms for 2 hours each dayNatural organic water for the toilets. All the rooms are decorated and furnished keeping in view to reflect the ecstasies of the past, giving the guest a feel of the royal living. * Note: Organic ayurveda diet menu as prescribed by our physicians. How is the Vaastu of the land and building? 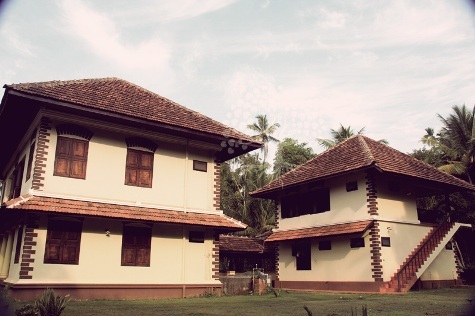 Typical kerala style heritage buildings.